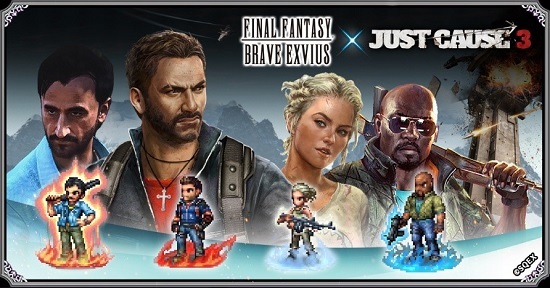 FINAL FANTASY® BRAVE EXVIUS®, the hit mobile RPG that has been downloaded more than 30 million times worldwide, celebrates its second successful year with a new Just Cause® 3 collaboration. This limited time event introduces numerous characters and a Just Cause 3 themed event to FINAL FANTASY BRAVE EXVIUS. Login Bonuses - From June 29 - July 11 and July 12 - July 31, players will be treated to generous second-anniversary rewards in addition to standard daily bonuses, including the special 10+1 Summon Tickets that will guarantee at least one 5-star unit and 5-star Guaranteed EX ticket. Free Daily Summon - From June 29 - July 26, players may summon one character for free per day. Players’ Voice Campaign - From June 29 - July 11, all players may vote in-game to select one of four generous promotions, such as a daily free summon. The promotion that receives the most votes will be implemented in-game during the month of August. Weapon Enhancements - Starting in mid-July, players may upgrade previously obtained weapons through a new limited-time stage, which will be a recurring event moving forward. FINAL FANTASY BRAVE EXVIUS is available as a free-to-play app (with in-app purchases) through the Apple App Store®, Google Play™ and on the Amazon Appstore™. For the latest assets, please visit the press site at http://sqex.to/Media.